This post is trashy. – Sunshine. Whimsy. Tacos. Back in February, I talked a little bit about Pfandflasche. 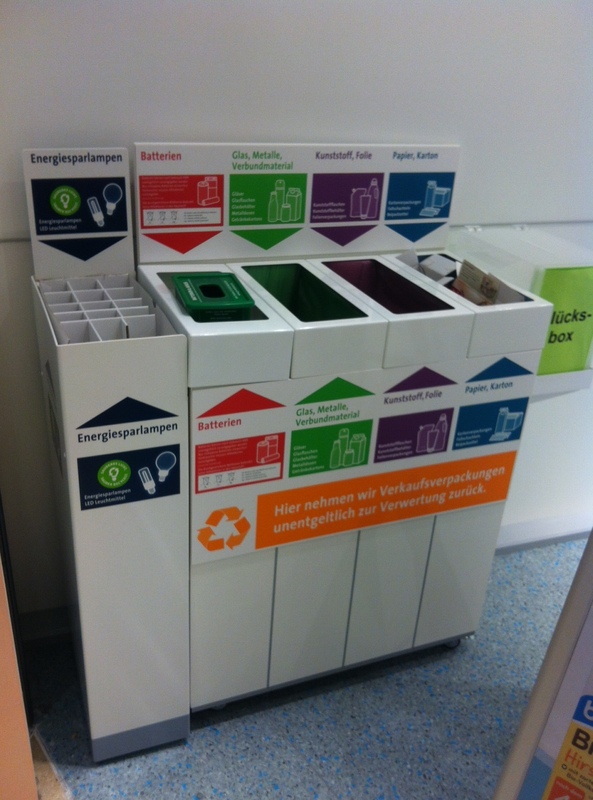 The bottle returns are just one tiny piece of the enormous tapestry that is German waste separation. When I moved into my apartment, I was given a garbage pickup schedule for all of 2012 and a roll of green garbage bags, which I’ll explain in a little while. Ok, so maybe it’s not quite as involved as The Oatmeal would have you believe, but it’s pretty close. 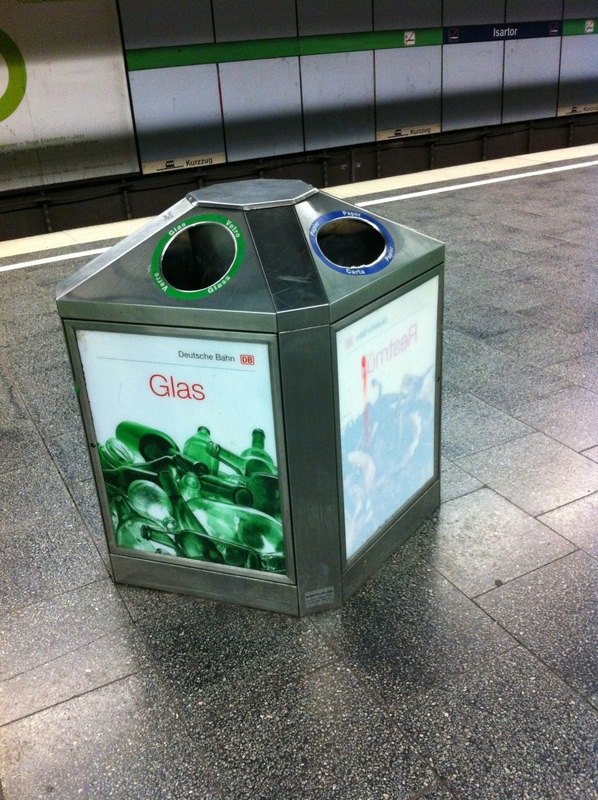 Most German households have at least three separate waste bins. Some have more. Paper. Any paper, cardboard, non-glossy packaging materials, receipts, newspapers, and so forth. This goes into the green bins downstairs for regular pickup. Packaging Material. 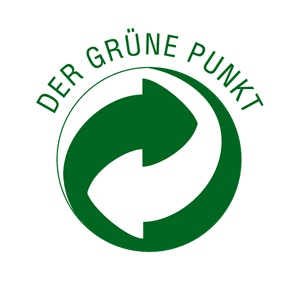 This is anything with the Grüne Punkt (Green Dot) logo, which is the signifier of packaging that conforms to the rules of the Green Dot system, to comply with the European “Packaging and Packaging Waste Directive – 94/62/EC.” Manufacturers have to pay for the privilege of using the Green Dot, and they’ve reduced their packaging as a result. The whole system is hugely complicated, but to the consumer, it just means, “Hey, this thing is recyclable.” This is the stuff that food comes in, mostly, but any consumer item can fit this classification. Also, there are lots of packaging materials that can be put in this bin, even without the Green Dot. These items get put into yellow or green plastic bags for separate pickup. In some places, the yellow and green bags are separate subcategories, but where I live they’re both the same thing. Everything Else. 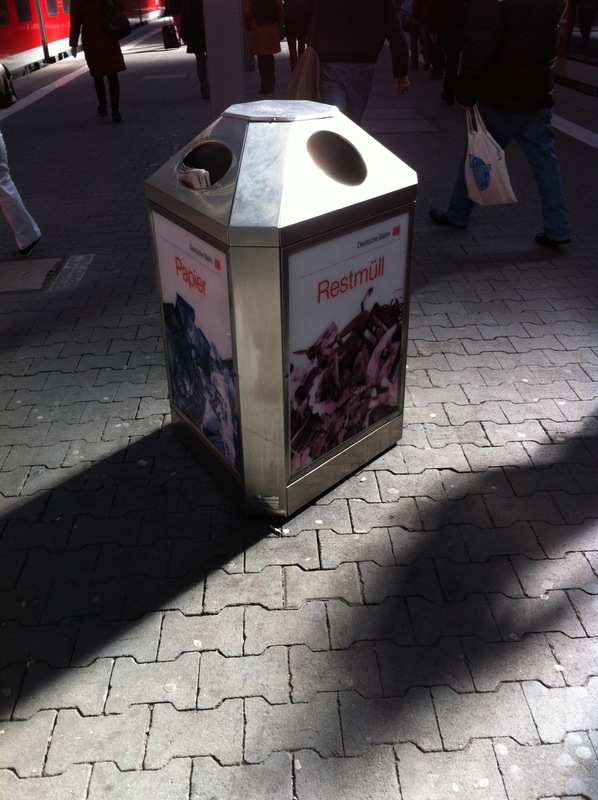 This is restmüll, the rubbish that doesn’t fit into the other recyclable categories. This is food waste and other types of household rubbish, and it goes into the grey bins downstairs. The grey bins are the closest thing to a dumpster that I’ve seen in Germany, and almost everything that goes into them ultimately gets incinerated or placed in a landfill. While I only have the three categories listed here, some places in Germany have brown bins for “bio” waste- in other words, anything that could be composted. Some places use blue bins for yet another category. The pickup schedule is pretty tight- there’s one pickup of the green paper bin each month, and two pickups per month for each of the other categories. The bins can fill up pretty fast in between pickups. On top of the garbage categories I mentioned here, and the Pfand that I spok e of, there are also places to drop off glass bottles and jars. The glass collection points are also subclassified- there’s individual slots for green, brown, and clear glass. There are separate dropoff locations for batteries and light bulbs; they go into little bins in local stores that are designated for just that purpose. 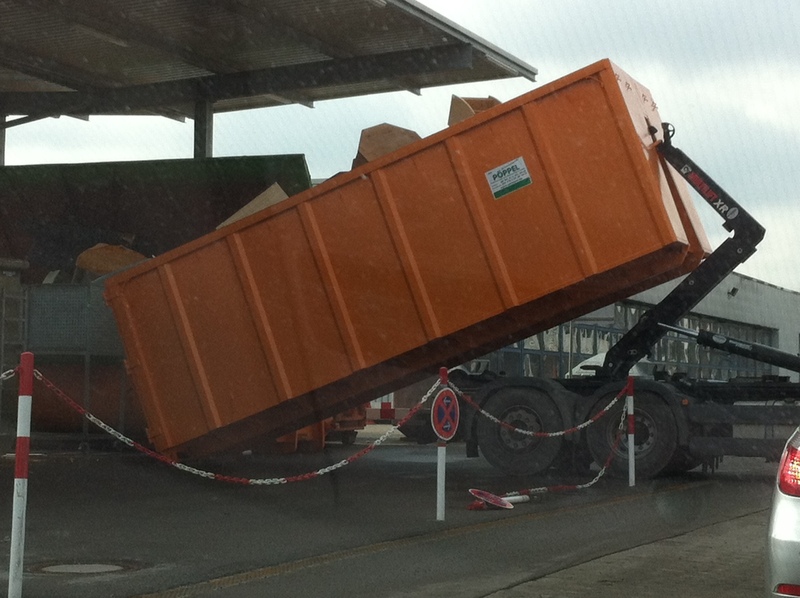 So what do you do if you have something that falls outside normal day to day household waste? What if you want to get rid of a mattress. Or a refrigerator. Or an old computer. What then? Well you go to the Recyclinghof, of course! 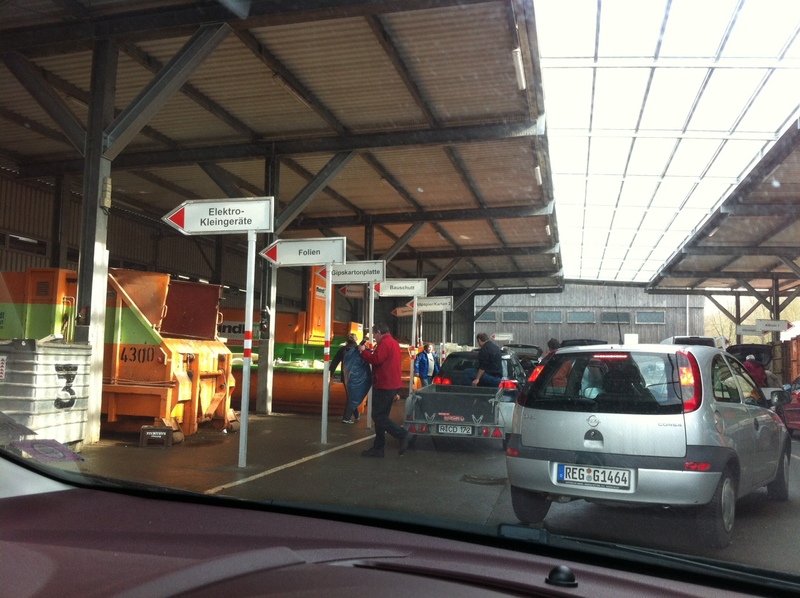 A Recyclinghof is a drive through facility with enormous bins for different types of stuff. Old televisions, computers, mattresses, furniture- you name it, there’s a category for it. There is staff on hand to help you sort your stuff into the right bin. Here’s just a few of the labels. This stuff is literally hauled away by the truckload. As you can imagine, this level of trash sorting is somewhat overwhelming for a newly arrived American. It took me a while to get the hang of it, and I’m still not entirely sure that I’ve got all the details sorted out. One thing I have noticed though- doing this level of sorting has made me significantly more aware of the waste I produce. It’s also reduced that waste by an order of magnitude. Since I moved into my apartment, I probably only generate enough trash to take out once or twice a month, not counting emergency evacuation for stinky food waste. Back in the US, I was taking out a load or two of garbage per week. Every week. The dump has become a fun trip for us, since we’re only doing it a couple times a year now, and in conjunction witha car rental. We love the drive-up-unload-toss-get-out-drive-away efficiency of it. Most amazingly: it doesn’t seem dirty at all. Haha. I did a garbage post a while back, and even included the oatmeal cartoon as well. But yours is much more detailed, so well done. 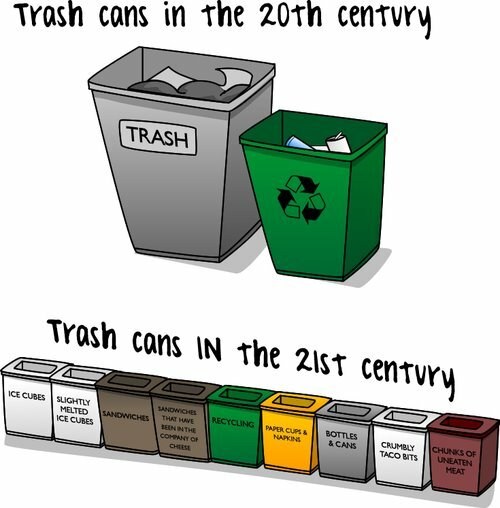 And well done on reducing your garbage as well…. it really does make a difference!